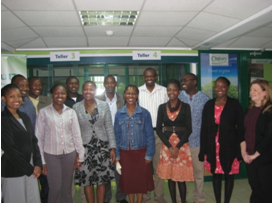 With a total headcount of sixteen employees that successfully serve 2,900 poor clients in Kenya, Century DTM knows a thing or two about efficiently leveraging human capital. But this young, progressive MFI has aggressive growth objectives. Its newly acquired deposit taking license requires Century to hire for a number of roles in different departments including Human Resource Management, Treasury Management, and IT, among others. Additionally, Century set up its first deposit taking branch in Nairobi and is striving to expand its branch network in rural Kenya. The organization’s leadership understands the human capital risks that might slow the growth of this dynamic organization and, therefore, the need to engage a Human Capital Management (HCM) expert to help design a path to sustainable growth. At the conclusion of this engagement, Laura presented Century’s leadership with a report that analyzed the organization’s current state of business practices and strategic challenges, as well as a summary of the current state of Human Capital Management practices and identified gaps between those practices and what is needed to support its mission and business strategy. The report offers specific, practical and feasible recommendations that can help Century increase the performance and effectiveness of its workforce, its internal processes, and the implementation of its business strategies.